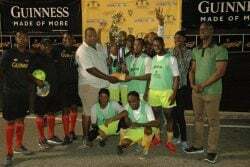 Defending champions Wismar/ Christ-ianburg Secondary overcame Warama-dong Secondary 5-4 on sudden death penalty kicks in an epic final as the Digicel National U18 Secondary Schools Football Tournament concluded at the Police Sports Club ground, Eve Leary, yesterday. Unable to be separated during regulation time and penalty kicks with the scores locked at 3-3 and 4-4 respectively, Wismar/Christianburg would prevail in a tense sudden death shootout that was a fitting conclusion to the tournament. With the weight of anticipation and expectation on his diminutive shoulders, Anthony Lane sent the Waramadong shot stopper Gerald Isaacs the wrong way to net the winning sudden death kick, sparking wild celebrations from spectators on the field. In an encounter that simply exceeded expectations, efficiency and organization met elegance and ability as the largest viewership since the tournament’s inception was captivated by a clash of contrasting philosophies. 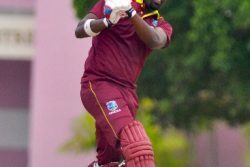 Accountable for their maiden title following his exploits in the 2012 finale, Marleque Davidson would open the finale in clinical manner with a 12th minute strike from a right side cross which sent their small fandom into loud applause. The Region 10 champions doubled the lead seven minutes later compliments of a well-placed running header to the bottom left hand corner from Davidson from a left sided cross. Appearing to be heading towards a lopsided affair, Waramadong Secondary would pull one back through their talismanic forward Whazir Bascombe in the 23rd minute to send the crowd into a frenzy. 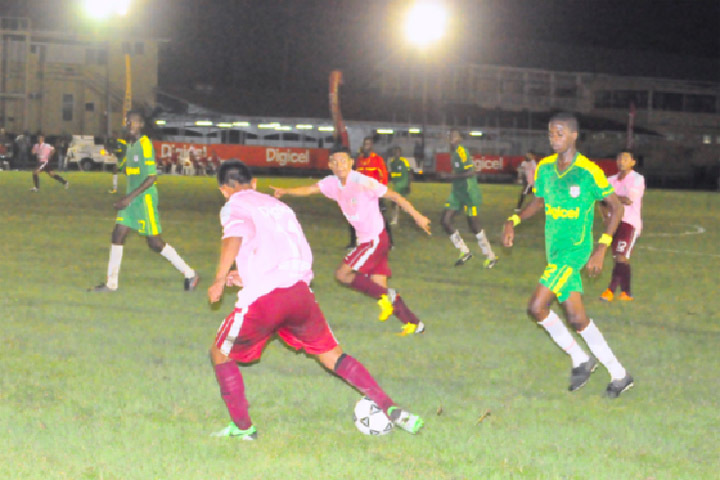 Receiving a pass from the right wing of the field, Bascombe without hesitation, unleashed a fierce right-footed effort from just inside the centre of the 18-yard area which evaded the outstretched hands of Wismar/Christianburg custodian Daniel English. The Region Seven champions would level proceedings in the 53rd minute compliments of a Jesse Morris 22-yard free kick. Awarded the spot kick following a hand ball outside the penalty area by English, Morris would let loose an absolute screamer of a right footed strike that went through the collapsing wall of players and nestled into the right side of the net. A Waramadong Secondary player battling with a Wismar/Christianburg player for possession of the ball. Clearly rattled by the Waramadong onslaught, the Linden outfit would surrender the lead in the 72nd minute to a brilliantly finished Bascombe lobbed strike following poor communication between the goalkeeper and the defence. Sensing their title aspirations slipping away, Wismar/Christianburg would display the mental fortitude befitting of champions as they found the timely equalizer in the 91st minute through a Shane Luckie effort over the advancing Isaacs. 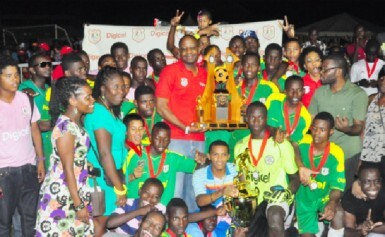 With the win, Wismar/Christianburg solidified their status as the best football secondary school in the nation as they collected the championship trophy, medals and one million dollars for the assistance in building and/or advancing any project within the institution. In the third place playoff, Region Four champions Covent Garden, led by a five-goal burst from Esan Haynes in the 18th, 32nd, 36th, 60th and 64th minutes, hammered Georgetown winners St. Georges High 7-4. Kevin Agard and Matthew Charles completed the score line with goals in the 21st and 68th minutes respectively. Ozeal Small led the Georgetown unit with a double in the 35th and 47th minutes while younger sibling Azuma Small and Adolph George netted in the 14th and 75th minutes correspondingly. At a simple presentation ceremony that followed the conclusion of the games, Digicel Chief Executive Officer (CEO) Gregory Dean and Head of Marketing Jacqueline James presented the trophies, medals and prizes to the respective teams. Waramadong Secondary for their efforts collected $500,000, the second place trophy and medals while third and fourth place finishers Covent Garden Seconday and St. George’s High received $300,000 and $200,000 along with trophies and medals correspondingly. The monies will also be used to build and/or advance any project in the institutions. 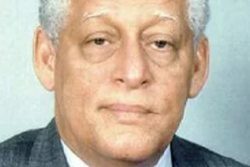 In order to access the funding, the schools will be required to present a proposal to Digicel. On the individual side, Bascombe was adjudged to the tournament’s most valuable player (MVP) with a competition leading 19 goals. The championship which is in its third year attracted over 160 schools from all 10 administrative regions of the country.